« College Making It Happen (Bus Ride)! 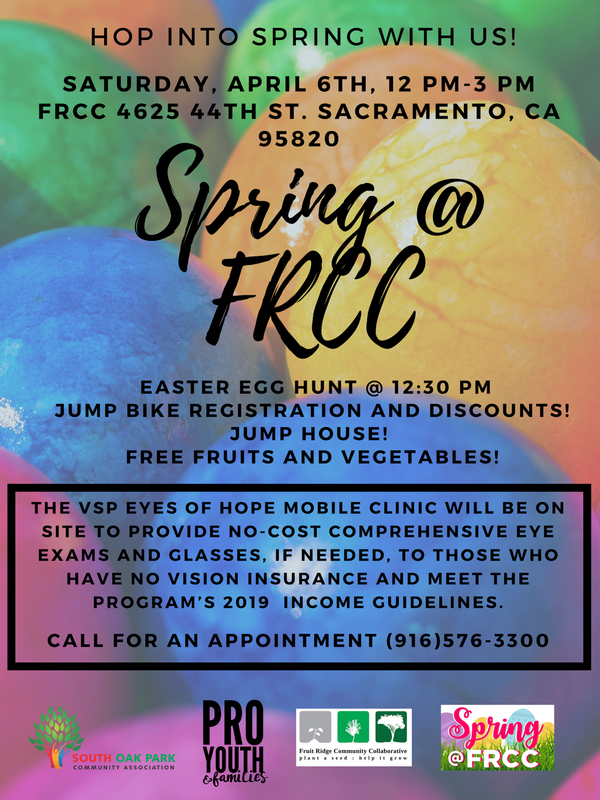 Hop into spring with FRCC! Spring @ FRCC will be held on Saturday, April 6th from 12-3 pm. This fun and interactive event will have a variety of activities for the whole family to enjoy together. This includes an Easter Egg Hunt (12:30 pm), photos with the Easter Bunny, a pop up pantry with free fruits and veggies, discount Jump Bike passes, yoga, a bounce house and more! In addition, to these fun activities we will have the VSP Mobile Clinic doing free eye exams. The VSP Eyes of Hope Mobile Clinic will be on site to provide no-cost comprehensive eye exams and glasses to those who have no vision insurance and meet the program’s 2019 income guidelines. Drops in are available, but appointments are encouraged. To make an appointment or see if you qualify call Erin Stone at (916)576-3300.